A few days ago the magazine LPQ sent me back my Seaside Sketch quilt I made for the 4th edition and they generously added two magazines to the package so I thought it might be a nice idea to give these two away to an interested reader. This will give you the chance to have a look at the magazine and also to make any of the great projects in it including the Sketch quilt. Wow, I saw your original sketch quilt, and thought it was brilliant. I'd love a chance to get hold of the pattern you wrote up for it. The blues look stunning too. I love that quilt, congrats on getting published again. Thanks for the chance of owning one of these! I'm not sure if its available in Australia, so it would be a real treat! 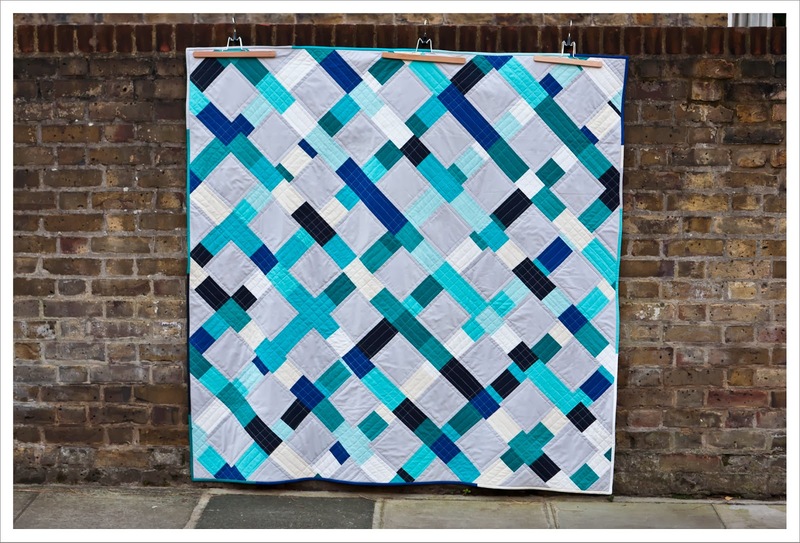 Love the quilt- a great use of solids! I would love to win! Haven't found the magazine in Australia yet. Lovely quilt would love to check out this mag thank you for the chance. Great quilt - congratulations on being published !! I love the way you've used colour in this quilt. The magazine looks like fun. Wish I could find it in Australia. Very pretty quilt. Must be great magazines. Thanks for the chance to win. Such a cool quilt. Magazine looks very tempting..
Good for you!!! That is something wonderful. I love the Seaside Sketch, and the scrappy binding is perfect :) It would be great to check out the magazine, looks full of fun projects. Your quilt is really lovely! Thanks for the chance to win a copy of this terrific magazine. 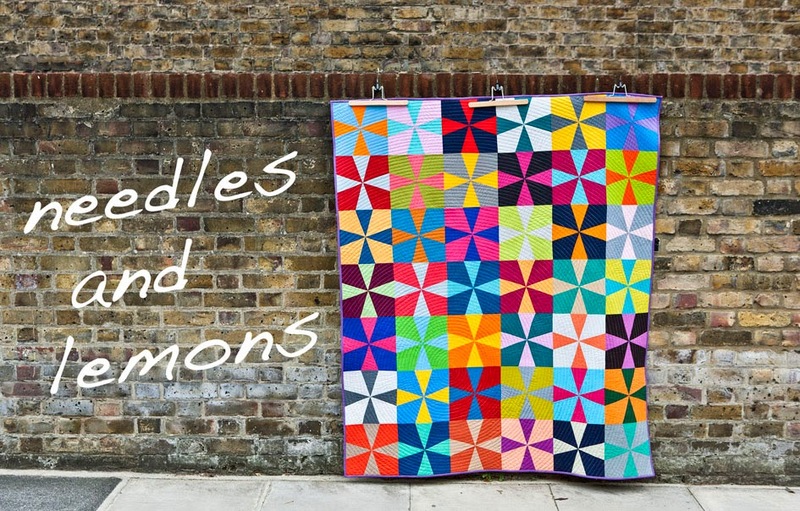 Tell Tale Threads - I saw your quilt on Flickr and went to your blog for more details. Love the colours and the design. Congratulations on being published and getting the wider recognition of your skills. What a great quilt and I see Maureen's quilt is on the cover... I would love to win this magazine! Pick me!!!! Love the quilt, haven't seen the magazine yet. I LOVE your Sketch quilt! Congrats on being published. Thanks for the chance to win. I love your quilt and that magazine is great! Awesome that you are in another magazine! Well done! What a wonderful giveaway! I'd love to have some new quilty reading on hand. Thanks for the chance to win it! I really love your quilt! I have been trying to find this magazine in Canada but I haven't been very successful I would love to win a copy! Would love to win the magazine, thanks for the chance to win! Gorgeous quilt, thanks for the chance to win the giveaway! This pattern would be perfect for the manly quilt that I have to make that I've been pondering for months now. I'm pretty sure I have all the blues I need too. Yours is a lovely quilt. Great pattern - I'd love to make it as a "boy" quilt for project Linus. Would love to win one of these copies, we don't have access to them here. Thank you! Thank You for the chance to win one of these magazines! The blue quilt is an awesome quilt for a man. Looks like such a great magazine - really love the Sketch quilt ! I would love a copy of this magazine, nothing like this available here in the Middle East. Oh that's pretty! Thank you so much for the giveaway, I rarely get around to buy any quilting magazines and it makes me sad! Your quilt is gorgeous!!! Thanks for a chance to win a copy of that magazine! I've been wanting to get a subscription!! I would love to see the magazine in person, thank you for the chance to win. I love your quilt, I keep looking at the photos. Would love to have a copy of this magazine. Looks like a great magazine. Thanks for the chance! would love a copy! btw your quilt is beautiful!!! Great use of colour in the sketch quilt. Have a nice day. love it ,love the color, love the pattern. Yes, I'd be interested in one of the magazines. How fun to have a quilt in a magazine (I have one in someone else's book). Nice quilt!